Conquistadors by Gary Simmons. Used with permission of the artist. In the spring of 1539, Hernando de Soto and his expedition landed in Florida to begin a four-year quest for valuable booty and vulnerable Indian societies that could be turned into laborers and Christians. 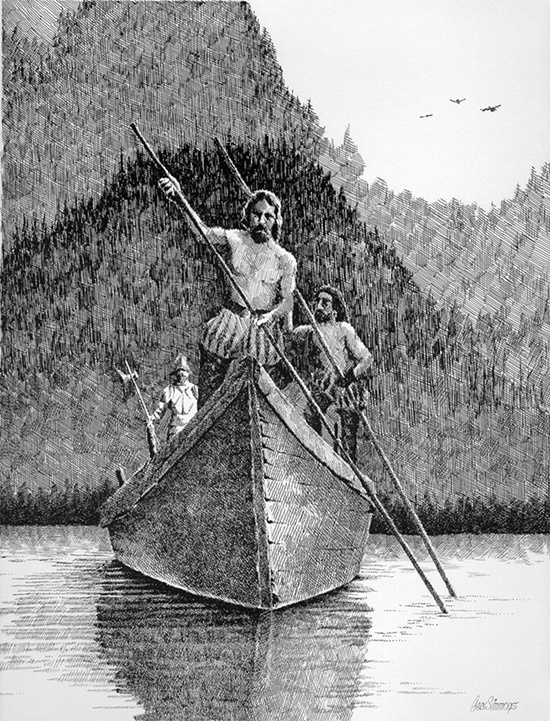 Soto lost his wealth and finally his life in the disastrous outcome, but there were two momentous consequences: Europeans learned about Native people of southeastern North America through expedition reports and survivors’ tales; and Native people were forever changed by warfare, disease, and subsequent environmental crises, shaping new societies that often broke with older cultural traditions and with the archeological signature of their ancestors. Four hundred years after the Soto expedition, historians, archeologists, and politicians undertook an ambitious re-telling of the event that culminated in a weighty report, published in 1939, laying out the likely route and events along the way. Archeologists hoped to use this report to guide them in linking historic Indian tribes to the mounds, artifacts, and other archeological remains of their pre-contact ancestors. Politicians and historians hoped to mark the expedition’s path on the landscape with markers, statues, newly named landscape features, and with amenities to attract tourists and enhance local histories. Arkansas lacked archeologists and any organized understanding of the age and distribution of archeological sites, but amateur historians enthusiastically joined the project to identify and mark the expedition’s trek through the state. The 1939 route became incorporated into local and state history and local landscapes over the next two decades. But as time went on, archeologists increased their understanding of Native sites and improved their ability to estimate the age and cultural connections of Native people across the Southeast, and they began raising questions about the 1939 study. Still, when the Arkansas Archeological Survey installed the first large group of trained archeologists in Arkansas in 1969, the age and distribution of de Soto era settlements across the state were largely unknown. Sites highlighted in the 1939 study were likewise poorly known. A high priority for the Survey in its first decade was to systematically document sites across the state, and to improve understanding of their age and cultural connections. Aided by advances in analytical methods, dating techniques, and accumulated scholarly knowledge in journals, books, and other reports that were spreading in professional meetings, Arkansas archeologists reevaluated sites highlighted in the 1939 report. Like their colleagues in other states, they found widespread mistakes in proposed age and cultural identity. 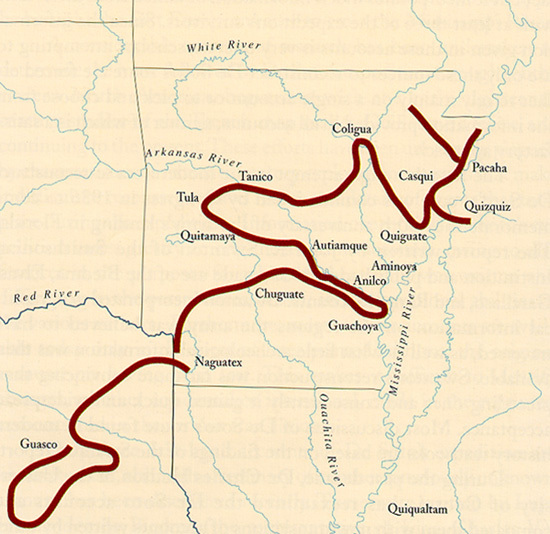 Hernando de Soto's route through Arkansas. By the early 1980s, when the 450th anniversary of the expedition’s landfall was approaching, the number of archeologists, ethnohistorians, and other scholars and average citizens interested in the Soto expedition had increased, and the information about archeological sites and artifacts had improved dramatically. University of Georgia ethnohistorian Dr. Charles Hudson and his colleagues instigated a multi-year, region-wide study and reconsideration of the written and archeological evidence. By that time, the Arkansas Archeological Survey’s database included new data on 17,000 sites, and there had been over 15 years of excavations across the state. Station archeologists Dan Morse, George Sabo, Frank Schambach, Ann Early, and others collaborated with Hudson’s research team, sharing information about the characteristics and locations of expedition era settlements and giving new information about sites used in the 1939 study. At a symposium held in 1988, these insights were expanded into presentations that were subsequently published in a volume about the de Soto expedition west of the Mississippi River. As a result of this collaboration, and decades of gathering information about Arkansas’s prehistoric sites, there is a new model for where the Spaniards traveled in Arkansas, and which Native societies they encountered. This information has been shared with colleagues and with the public through the Encyclopedia of Arkansas History and Culture, Arkansas history textbooks, scholarly and general publications, and through interpretive exhibits at places like Parkin Archeological State Park, where we now believe one of the fateful encounters between Spaniards and Natives took place.